Voicethread is an online tool that fosters language development and 21st century skills. It allows creative and collaborative communication. With Voicethread the students are working together to create an end result that they are proud of. The goal is to demonstrate how to use Voicethread for formative and summative assessments through writing, reading, speaking, and listening. 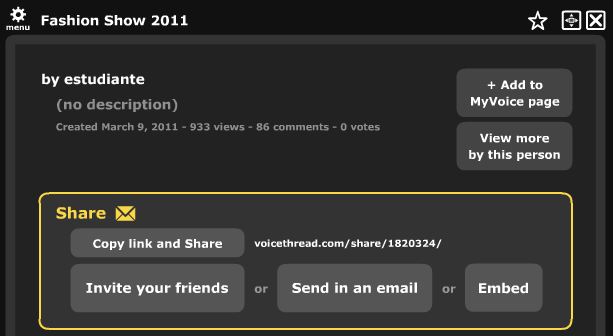 Voicethread is a cheap or free (depending on the type of account) online tool. A variety of media (pictures and videos) and document types (Microsoft and PDFs) can be uploaded to Voicethread. Comments are made on the slide through text, audio, or video. Comments can also include doodles on the media. A group of my students presented at PETE&C in 2010. The students created a Glog to explain our version of Think-Pair-Share. It involves peer editing with GoogleDocs and publishing with Voicethread. As a formative assessment tool, the teacher can easily identify mistakes and re-teach if necessary. Students have been extremely motivated by using Voicethread. They show pride in their work and enjoy sharing it with their friends and family. The biggest sign of success, students request to use Voicethread for publishing their writing prompts. Below are examples of classwork for 6th grade and 8th grade Spanish students. Most of the assignments were formative assessments, so the emphasis was not on perfection, but applying the vocabulary and expressions we had been practicing in class. The students are comfortable using Voicethread. I make sure that the class activities match up with the assessment. The Fashion Show is the end of unit, summative assessment for Spanish clothing. The students describe their classmates outfits. To prepare for this, a Voicethread is created with images from Award Season - the pretty and sometimes crazy outfits of celebrities. Students practice with the same prompt that they will use for their summative assessment. Initially they describe in fragments. Then as we progress in the unit, they add articles and adjectives that agree. The final stage is describing the entire outfit using complete Spanish sentences. It does take a little more time to put everything on Voicethread, but when you look at the number of views or the enthusiasm of the students, it justifies it. The screen shot below shows that this single Voicethread, from one year of students, has 933 views. They checked out themselves, their classmates, and were proud and shows their friends and their family. When we do the directions unit in 8th grade, I really challenge them to read, write, listen, and speak. All of the formative assessment is done through Voicethread. The students are also writing/speaking the prompts that their classmates need to follow. Every year there is a naturally occurring competition to see who can figure them out first. in order to prevent cheating in the friendly competition, I toggle/untoggle the comment moderation for different activities. Teaching middle school students to give and follow directions (and read a map) is a unique challenge because they are not driving yet. They do not have a strong grasp of location. We start off with the school. Then we use the community. Finally, we make connections to the country and city we are reading about by also including those streets in our direction repertoire. This year the students were so excited about Directions that I sent them on a QR Scavenger Hunt with directions around the school. It was a huge success (even with a code that 'disappeared' twice). Our school uses TPRS as the methodology for teaching language at the middle school. The students learn the language through stories. This collaborative story was after the first marking period. The students were encouraged to contribute to the extent that they could. Some students had single word answers, others had phrases, or an entire sentence. It was not about perfection, but being able to tell a story. The next day we combine the pieces of a puzzle to create a story. Below is the completed version of the story for one of the 6th grade classes (click for full size image). This is a perfect example of a formative assessment. Students were writing sentences in Spanish using comparisons. It is not a challenging concept, but it is different then in English. There were many images that could have been described, but the students only had to select five. Animals and adjectives were a review from previous units, so I wanted to ensure everyone was able to describe the picture. The comparison built on a basic descriptive sentence. The two days after we did the Voicethread, I pulled examples of common mistakes and posted them on the class website. They edited with a partner then we discussed as a group. Have the students draw or design on the computer their own, fictional creature. They are encouraged to be creative and silly is ok. They then have to write 5 sentences in Spanish about the creature. Computer files were submitted on Edmodo. Pictures that were drawn by hand were uploaded by digital camera. Normally I provide some feedback to students before they publish their sentences to match the picture on Voicethread. Voicethread is a great way to have students participate in conversations about culture. Before we discuss a culture, I can create a Voicethread using creative commons images from Flickr. I then have the students either partner up or view it independently. They are allowed to make statements or ask questions in English. The goal of this is find out what they are interested in and expose them to a vast topic like a country's culture. They can also tell their own stories: if they know someone from the country or if they have traveled to this place. They can make connections to things they already recognize. The Passport Project was slightly different. Each student was assigned a country to be a mini-expert about. They created a poster with images. I took pictures of their posters and they posted the facts as a comment. This was the week before a holiday, and there were so many students out. This way everyone shared their information and heard from their classmates. Ms. Butler teaches Spanish in a 1:1 netbook classroom environment. The school purchased Voicethread accounts for all secondary students. Voicethread is used in conjunction with other educational technologies: GoogleDocs, Moodle, Edmodo, etc. 4. The use of Voicethread for practicing language skills: listening, reading, speaking, and writing. 5. The use of Voicethread with 21st century skills: communicating, collaborating, and being creative. Either use the website or download the app from iTunes. Blake, R. J. (2008). Brave New Digital Classroom Technology and Foreign Language Learning. Washington D.C.: Georgetown University Press. Bush, L. (2009). Viva VoiceThread: Integrating a Web 2.0 Tool in the Additional Language Classroom. In I. Gibson et al. (Eds. ), Proceedings of Society for Information Technology & Teacher Education International Conference 2009 (pp. 3247-3250). Chesapeake, VA: AACE. Lucas, Lisa J. "Awake, Accountable, and Engaged." The National Teaching & Learning Forum 19.6 (2010): 1-4. Web. 29 Sept. 2011. Partnership for 21st Century Skills. 2004. Web. 26 Sept. 2011. <http://www.p21.org>. Siemens, George. "Learning and Knowing in Networks: Changes Roles for Educators and Designers." Instructional Technology Forum. 27 Jan. 2008. Web. 28 Sept. 2011. <http://it.coe.uga.edu/itforum/>.